Red cheeks and sweaty hair after an afternoon outside! Yesterday Kate had her first clinic appointment in three weeks!﻿ I was eager to see her lab work but so nervous about the appointment. Since Kate's central lines were taken out, I knew Kate would have to be poked for her blood draw. She hasn't been poked in nearly 8 months and now that she is older, she is so much more aware of pain and such. I packed a post blood draw prize (Elmo stickers - her current obsession) in hopes of cheering her up once things were done. Kate was so brave and did so well with the poke! Holly and Jessica (two amazing nurses that have taken such wonderful care of Kate from the very beginning) helped this big, pregnant momma hold Kate in place and Holly got a good vein on the first attempt! Kate cried a little bit but as soon as it was over, she was happy and handing out stickers to anyone that would take one! I am constantly in awe of how brave, strong, and resilient Kate is. She is such an inspiration to me. She's been through so much yet is still such joy - telling everyone hi, flashing her sweet smile to anyone she sees, and has such a precious spirit! I am so blessed that I was trusted to be her mom - she has made me a better person! Now to the title of this post - Normal. A word that we don't associate with often. 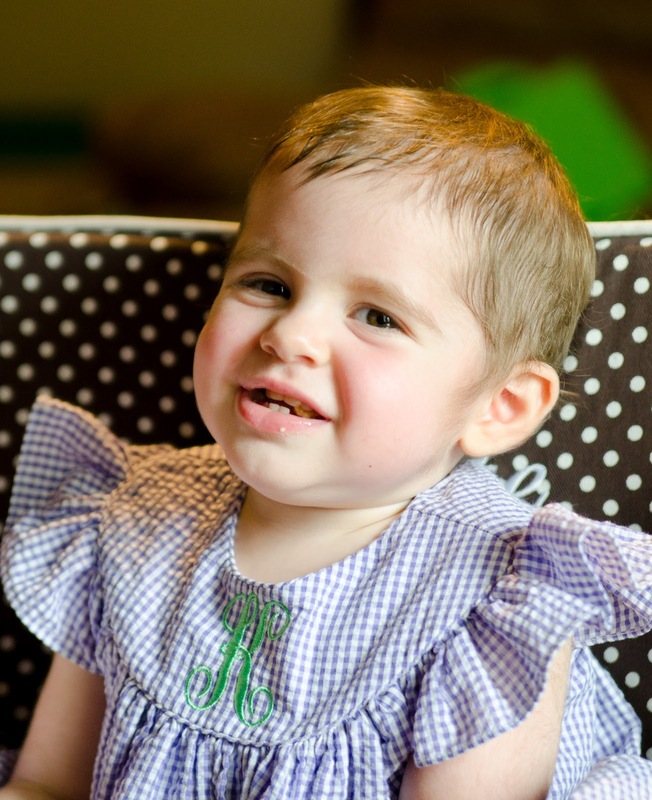 However, yesterday, for the first time since she was 6 weeks old, all of Kate's lab work came back normal. Everything was normal. Hemoglobin, ANC, white count, platelets. I know we still have a long way to go before Kate can act like a normal toddler free of all restrictions. But, normal blood counts are HUGE. This is a milestone I have often felt was completely unattainable. My sweet friend Trisha, another BMT momma, has always told me "slow and steady wins the race". She reminded me of this when it was taking forever for Kate to engraft, when Kate's platelets were not increasing, when Kate's hemoglobin was low. I'll be honest, sometimes I wanted to shake her and say "I don't want to hear that. I want things to be better RIGHT NOW." But, now that we have finally made it to this point, I have to admit, she is right. It may have been a slow, grueling journey to have Kate's blood counts return to normal, but all that matters is that Kate made it! Normal has never felt so amazing! so happy for you and katie. praise to god! Such wonderful news!! Kate is as strong as she is because of you! You are such a strong momma. And she looks so much like you in that picture, I think. Yay for normal!!! Love, love, LOVE this news and I love that picture!! So incredibly happy for sweet Kate. And I can only imagine the happiness you must be feeling mama! I'm so happy for y'all! This post had me crying. Wow! The power of prayer! Nothing is better than that!!! Great news! What wonderful news! An answer to so many prayers! You could have told me to shut my mouth! :) I KNEW she would be okay...she was just taking her own sweet time. And the timing is perfect because now you can relax (a little) and not worry (so much) about her, and start to focus on your little man! Can't believe he's almost here! Love you guys!